Home » Market Analysis » Time to Break Up the Too-Big-To-Fail Banks? In January of 2009, I wrote a post called “Default Option.” My outrageous plan was to simply let the banks fail. Some people told me that was an unthinkable way to handle the financial meltdown, but I still think otherwise. Yes, it would have been rough. Bondholders and shareholders would have been wiped out, unemployment would have shot up, and lots of people would have lost money. Back then, I wrote, “In short, the incompetent banks would be liquidated and competent banks would take over the assets that are left behind. Instead, the pundits of Wall Street are basically telling America,” You make us (the banks) whole first, and then we will lend you your money back!” That is simply outrageous because we are rewarding the incompetent!!!!!! !” For the financial system to function normal again, the debt had to be flushed out and for good reason. I also wrote, “Letting the reckless banks fail will limit taxpayer exposure, preserve our capital, and our credit rating as a country. Bank failure will wash bad debt out of the system once and for all and protect the dollar from free fall. Finally, I think in the end it will be cheaper and more effective than what has and will be done in the future to “fix” the credit crisis.” (Click here to read the entire Default Option post.) We could have protected every depositor with less than $5 trillion dollars. We have already spent that much and more and still face the possibility of a sudden and out of control systemic failure. “Absurd,” say critics such as Max Gardner III of Shelby, North Carolina. 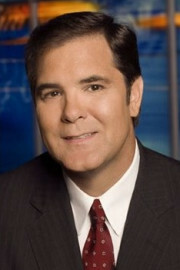 Gardner is considered one of the country’s top consumer bankruptcy attorneys. “This is not an oops. This is not a technical problem. This is not even sloppiness,” he says. The problem is endemic, and its effects will be felt for years. The reason the mortgage notes were never assigned may be that there was no party legally capable of accepting the assignments. Securitization, in its origin, was a tax avoidance procedure, based on the formal difference between secured loans and sales. To qualify for the tax exemption, the conduits between the original lender and the investors could own nothing. Only the beneficiaries—the investors who advanced the funds—can claim ownership. And the mortgages had to have been recorded in the name of the beneficiaries the year the MBS closed. The problem is who ARE the beneficiaries who advanced the funds? In the securitization market, they come and go. Properties get sold and resold daily. They can be sliced up and sold to multiple investors at the same time. Which investors could be said to have put up the money for a particular home that goes into foreclosure? MBS are divided into “tranches” according to level of risk, typically from AAA to BBB. The BBB investors take the first losses, on up to the AAAs. But when the REMIC is set up, no one knows which homes will default first. The losses are taken collectively by the pool as they hit; the BBBs simply don’t get paid. But the “pool” is the trust; and to qualify as a REMIC trust, it can own nothing. As comedian Jon Stewart said in an insightful segment called “Foreclosure Crisis” on October 7, “We’re back to square one.” While we’re working it all out, an extended foreclosure moratorium probably is in the works. But this needn’t be the economic disaster that some are predicting – not if the FSOC is allowed to do its job. We’ve been here before, and not just in 2008. The 1934 Act was subsequently challenged by secured creditors as violating the Fifth Amendment’s due process guarantee of just compensation, a fundamental right of mortgage holders. (Note that this would probably not be a valid challenge today, since there don’t seem to be legitimate mortgage holders in these securitization cases. There are just investors with unsecured claims for relief in equity for money damages.) The Supreme Court voided the 1934 Act, and Congress responded with the “Farm Mortgage Moratorium Act” in 1935. The terms were modified, limiting the moratorium to a three-year period, and the revision gave secured creditors the opportunity to force a public sale, with the proviso that the farmer could redeem the property by paying the sale amount. The act was renewed four times until 1949, when it expired. During the 15 years the act was in place, farm prices stabilized and the economy took off, retooling it for its role as a global industrial power during the remainder of the century. Ellen Brown wrote this article for YES! Magazine, a national, nonprofit media organization that fuses powerful ideas with practical actions. Ellen is an attorney and the author of eleven books, including Web of Debt: The Shocking Truth About Our Money System and How We Can Break Free. Her websites are http://www.webofdebt.com/articles/ , ellenbrown.com, and public-banking.com. As usual great article with historical perspective. One of the problems with motivating the general public is that none of the dire predictions come true within the average person’s attention span.Still it would be a good idea to stop bailing out the banks which have essentially become criminal enterprises. Perhaps the file clerks and tellers are innocent; even the VP’s of whatever. At the executive levels it is a different story; they are consciously criminal in their extortionate behavior. Repeal of Glass-Stegall will eventually be seen as one of the root causes of this depression. At the time I wondered how this could be beneficial or even prudent given the fairly recent Savings and Loan debacle. Allowing banks into the insurance and equity markets was an invitation to a sophisticated group of confidence men and women to join an unparalleled opportunity to loot the savings of the working and middle classes. This is nearly complete. The only action remaining is the nationalization (confiscation) of the still extant 401 (k) and similar accounts. This is not likely with a Republican majority. That alone is reason to vote for anyone not a Democrat. Let the banks fail, restrict their activities to 1990 levels, abolish the Federal Reserve and fractional banking. This going to happen anyway, not for me as I am too old, but within 10 years the collapse will be complete. Even Clinton (42) know it was a mistake. Thank you for your participation in this site. Thank you George and Diane. I did not know how Ellen would be received but now I do. 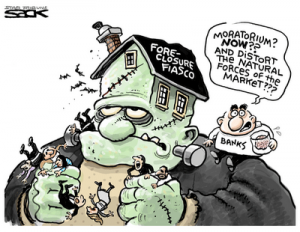 Ellen Hodgson Brown’s article explains the legal issues surrounding the foreclosure mess, and it’s very well written. For this topic, you might include some other scenarios, such as what the Federal Reserve might have up their sleeve, whether or not there may be a deeper plan to have created this mess in the first place (by those who might profit from a bailout), what may occur if the MBS market unwinds globally, or how ordinary citizens may have faith to purchase real estate again (that is, who might their lender be if they don’t engage in an all-cash purchase). I think you folks up there in the Northwest are pretty smart! Since the contract with the federal reserve is almost done, they can say”mission accomplished”. They did what they were created to do. All of this garbage going on is intentional. My father still reads the Wall Street Journal and watches the TV. He’s just another one of the brain-dead sheep that insists everything is fine. I don’t think he’ll be around long enough to see what they do when the debt actually becomes due. Once the creditors of the debt start collecting maybe people will start waking up. UNITED STATES is not a government. It is a corporation. A corporation that went bankrupt in 1933. Since we are operating under receivership everything you own, plus you and your childrens bodies, are the collateral. I pity everyone when they come to collect. Greg,I think you need to do an article on HJR-192 and the bankruptcy of 1933. “United States is not a government. It’s a corporation.” Good stuff Bildo! Thank you. Even if the debtors collect on the debt there are about 1,000,000,000,000 other problems to deal with. These name a fraction of 1% of all the problems. We live in a world, of rising populations, declining oil output, declining nonrenewable resources, with water scarcity, melting icecaps, and a significant rising carbon footprint… Oh yeah, can we fed that rising population? This whole financial endgame is mute compared to all the other endgames. I guess what fascinates me, is how calm everything seems, in my part of the country. No-one is hitting the panic button. There is a rise in homeless people, but most of these people seem to have drug problems. Someone said that there may not be enough attorneys to unwind this. These banksters, and the government regulators involved, all need to go to jail. This may very well turn out to be, the biggest crime spree, ever in American history. I like Ms. McKeever! Thank you for this. Greg,here it’s sat afternoon & I have read some very upsetting articles posted at http://www.caseyresearch.com/gsd/edition/silver-shortage-looms-rick-rule. Ed Steer has posted links that explain events that are going down world wide. It has some of the best articles about the MBS’s,one world government,the IMF new roll as the new world bank,and so mush more about what the heck Americans are facing very soon because the Power elites fear the rise of the Tea Party that is spreading & would be a danger to their plans they set in writing when Woodrow Wilson gave control to Federal Reserve in 1913. Greg,I hope you find time to read the articles that Ed Steer put on his web site & then share your thoughts with all of America. It’s alot to ask of you, but I do not know when these evil elites will pull the switch on the INTERNET because of the ever growing strength of the Tea Party that is Spreading to out side of the USA to other Nations that are being attacked as we are! GOD BLESS YOU GREG & YOUR FAMILY & MAY YOU STAY STRONG UNDER GOD’S HAND! Thank you for the comment and blessing! “Rewarding the Incompetent”; isn’t that what our nation has devolved into? As example I give the following: two out of three branches of federal government service without term limits-Judicial and Legislative (jobs for life); Corporate Executives that, once having acheived the magic leters: C-E-O, move from one feeding trough to the next, regardless of the results and in many cases disasters left in their wake; and perhaps most agregiously the media ‘talking heads’ who have lost the ideal of ‘observe, report, and question’ journalism for entertainment, ratings, and sesationalism. The triggering events for a global, societal meltdown are rapidly coalescing: riots in France over benefit restrictions, protests in the UK over austerity planning, a 400K document ‘peek’ at the real, ugly side of the Iraq war, and probably a hundred other events that I am ignorant of. Just imagine if our congress would ever dare touch any of the ‘third rail’ issues here with any meaningful and long overdue reform. I for one do not think we will have to wait that long-the collapse will arrive much sooner. Thanks Greg and contributors for the excellent writings, maybe like “Noah’s Ark” some will be saved to begin anew. Loved this line “maybe like “Noah’s Ark” some will be saved to begin anew.” Thank you for your comment! THERE IS NO FEDERAL GOVERNMENT. United States is a corporation!!!!! It sure looks that way to me too! My kid use to bundle house loans into securities I ask him about the paper trail on who has the title he said out of a thousand house loans he might of had three without a complete trail in the bundle when he pass the paper work to the next step. He is just a young man but he said this idea of no proof of title is a small matter in the amount out there. We know it’s more about the worth of the securities that’s is the problem and who put the triple A rating on them. I don’t understand all this stuff but this banker kid of mine is honest and said this is what he say and did for a few years. When people ask me about my kids I say one turn out bad and the other one lives at home with no job like a normal kid. Thank you for posting Ms. Brown’s column. However, she did miss some points that I’ve heard on talk radio (KVI), and that is that these foreclosure mavens were so greedy that they would pounce on language. That is, that if the LENDER goofed ever so slightly on the mortgage papers, then the LENDEE was at fault, and could have property foreclosed on! Also, that that member of the Federal Reserve, Bank of America, decided to ignore all calls for suspending foreclosures on homeowners. They’re doing it anyway, even though they are the ones who are the worst! Woe on to anyone who thinks that government can “help,” as government has been so naked in its greed that it’s hard to tell where a corporation ends and government begins. Is this where Gerald Celente is right? Where those who have nothing, and have nothing left, will have nothing to lose? That we’ll finally have violent protests in the streets of America as well? Thank you Sam and Mountainaires. I hope you will be seeing Ms. Brown’s work here again soon. She was a big hit with the readers here! Love Ellen Brown, and bought her book Web of Debt. She’s a great teacher, or at least was for me. Glad to see her here, Thanks Greg! You have gathered some of my favorite writers,/economists/journalists to inform us all here. Such a great site!